The Kendal All-in-one provides a range of functionalities in one machine. This awesome best foot spa machine provides oxygen bubbles massage, heat therapy and high frequency massage, along with infrared therapy and magnetotherapy. That’s plenty of soothing and relaxing functionalities all in a single machine. This model incorporates a heating function to bring extensive relaxation to your tired feet. It can heat up cold water and will keep the water hot. The oxygen bubbles massage the feet and also help relax them. As the bubbles rise from the bottom of the machine, one can get a deeper massaging action. The high frequency massage helps relax the feet, release trigger points and ease away the pain.The infrared therapy alleviates fatigue, stiffness and pain in the feet. Magnet Therapy cleanses the body of toxins. The unit is easy to use. The Kendal All-in-one enables the user to control the temperature. The temperature can easily be adjusted between 20℃ and 48℃. Unlike many foot baths that can’t even keep water hot, this machine heats up cold water and keeps the temperature. The six indicator lights enable you to view the treatment time to eliminate the guesswork. The control panel also has on/off switch for hassle-free use. Lightweight at just 5.3 pounds, the unit measures 17 by 13 by 10 inches for easy placement by a comfortable chair or the sofa, ensuring total relaxation every time. The machine boasts high quality and safety. 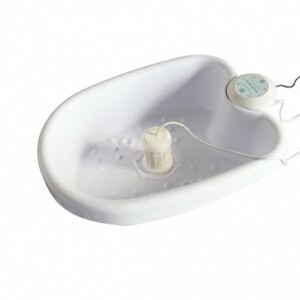 A perfect gift for yourself as well as other people, this foot spa has a body constructed of high quality plastic, which can withstand the high temperature conditions it is used in while being able to resist disintegration brought on by continuous use down the road. The foot spa employs a US DuPont-made Positive Temperature Coefficient (PTC) semiconductor that serves as the primary heating element that also provides double security against overheating.This element provides fast heating, keeps the temperature constant and offers multi-insulation protection as well. This foot spa is able to promote better blood circulation. Because your body systems tend to be in constant chaos due the daily stress, you need this machine to generate a state of balance and harmony in order to ensure good health. The massage functions provided by this machine deliver pressing and rubbing of your toes and feet to ensure good circulation of energy and blood. Your everyday diet, unhealthy lifestyle and stress can make toxins accumulate in your body. Those toxic impurities could easily prevent the free circulation of blood, thereby preventing the effective transport of oxygen and essential nutrients to the various organ systems for optimal health and well being. The blood also ensures effective flushing out of wastes from the body. By ensuring proper blood circulation, this foot spa ensures that toxins do not stay in the body and cause an innumerable amount of sickness. Stress is reduced by the foot massage function to improve blood flow and reduce accumulation of wastes and toxins. This device relieves fatigue and smoothens your Qi or meridian system. Beyond any doubt, stress on the feet affects a person’s state of mind and physical well being due to energy imbalance. By stimulating the solar plexus reflex, this foot spa machine helps your body manage stress better while keeping you grounded on your feet, literally. This results in an enhanced immune system as well. The small size of the machine makes it the perfect foot spa for women. The basic design ensures simplicity in use. This is primarily a device for personal use, and the small size and light weight plus full functionality drive home the fact that the foot spa is engineered for effortless use by ladies who want an effective means to relax on their own.